Jane Addams (1860-1935) was a social and political activist in the early 20th century who made many valuable contributions to the emerging field of sociology in America, especially in the areas of immigration and ethnic groups. Addams was a native of Illinois, born into a wealthy and influential family. At a critical point in her life, she dedicated herself to assist those who were the victims of neglect and exploitation, since modern culture did not seem motivated to intervene. Evidently, Addams understood that in America, the problem was not simply economic, as it was in England, but also ethnic and cultural. She decided to start her own reform residence, using a place called Hull House. This offered many services, taken for granted today, but ground-breaking then, such as child care, instructions in English, and rooms for union meetings. In the area where Hull House was located, a collection of first generation immigrants from Italy, Ireland, Germany, Greece and Eastern Europe had settled to find work in the city. 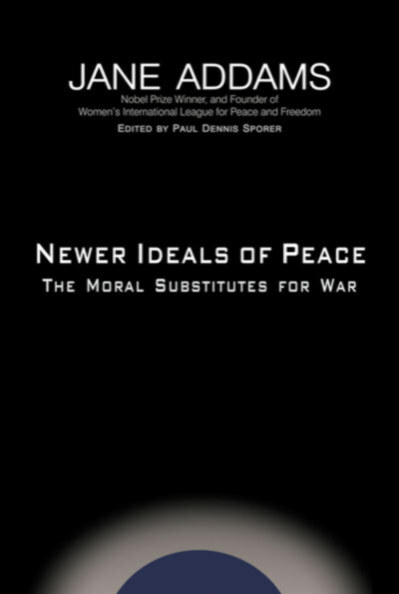 It is in this environment that Addams made many important observations of human nature, which undoubtedly helped her to form the conclusions found in her most important work, Newer Ideals of Peace.